Tripod specialist Benro is introducing its first in a range of electronic gimbal stabilizers. The RedDog R1 is a three-axis motorized gimbal which allows you to shoot video smoothly and control camera movements. With a maximum payload of 1.8kg it is capable of supporting many mirrorless cameras and smaller DSLRs when shooting video when a tripod is not possible - or where you need to change camera position to follow moving subjects. 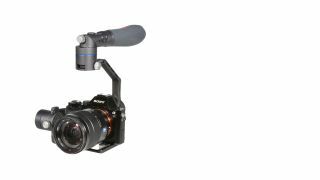 The stabilizer has been particularly designed with Sony and Panasonic mirrorless CSC cameras in mind by offering shutter and video on/off controls from the handle, and also allowing control of the zoom with Sony Power Zoom lenses (the necessary Sony and Panasonic cables are supplied). The RedDog offers a 'unique' swivel handle designed for different filming angles and compact for travel. The 'upright mode' is suitable for high and medium angle filming while 'carry mode' is best for low angle filming. 1) Locked-down mode Locked-down mode keeps the camera locked on a subject while moving the gimbal. This allows users to replicate movements traditionally made using a jib or slider. 3) Universal follow mode The Universal follow mode, provides smooth camera movements towards the subject. This mode is ideal when circling around a subject with the camera. Weighing 879g, the R1 boasts that it can last for 12 hours between charges and comes with a carry case that allows users to retain the individual axis positions – saving setup time at the next location. Recharging the unit takes three hours. The RedDog R1 will retail for £350 / $399.